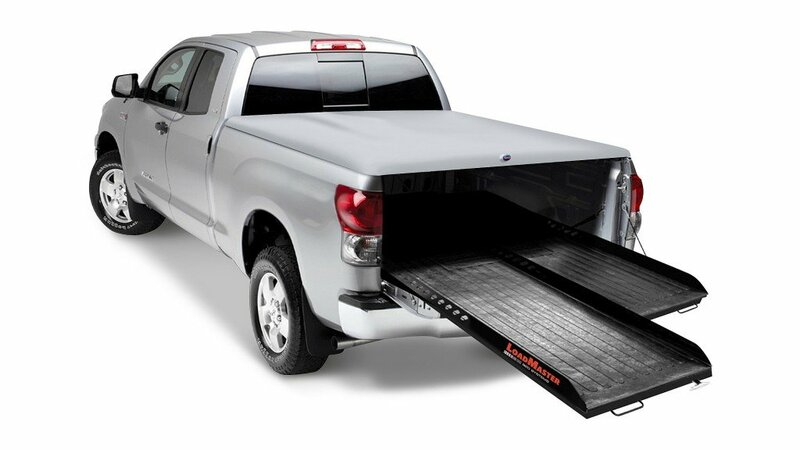 The LoadMaster FE provides 100 percent extension from the bed of the truck with four different locking positions. Available in 1,000 and 2,000 pound weight capacities, the FE system fits multiple bed sizes, including full-size and mid-size short and long beds. LoadMaster, a subsidiary of LTA Manufacturing LLC, has expanded the product line to include two new in-bed cargo management systems: Full Extension (FE) and Dual Slide (DS). These two new styles join the Standard Duty (SD), Heavy Duty (HD) and Composite (CP) in-bed cargo management systems. The LoadMaster FE provides 100 percent extension from the bed of the truck with four different locking positions. Available in 1,000 and 2,000 pound weight capacities, the FE system fits multiple bed sizes, including full-size and mid-size short and long beds. FE cargo management systems come complete with a removable rubber deck mat, laser cut steel side rails, a spring release T-handle and powder coated reinforced steel frames. The FE is also available with optional Extreme Side Rails (XT). The XT option is bed-deep, water jet cut and powder coated with multiple tie-down locations and is comprised of lightweight aluminum that is formed over the wheel wells. LoadMaster has also added the new DS to the product line. The DS features two sliding in-bed trays which offer a total weight capacity of 1,200 pounds with each tray supporting up to 600 pounds. The DS allows for up to 70 percent extension from the bed of the truck and features three locking positions: in, half-way and fully extended. DS systems are comprised of powder coated steel frames. A five year limited warranty is offered to general consumers, and commercial applications receive a warranty period of three years. The warranty covers defects in materials and workmanship and requires that products be installed by an authorized LoadMaster dealer. Weight capacities are designed for evenly distributed weight. Volvo Trucks' newest series of parameter updates complements its newly-launched Parameter Plus subscription package, which allows for up to 50 parameter updates annually per covered vehicle. With over 250 parameters to choose from, this new set of updates will provide customers with notable value in terms of cost savings, fuel efficiency and uptime. XL Specialized Trailers is releasing a newly designed Low-Profile Hydraulic Detachable Gooseneck (HDG) trailer to its lineup. The trailer offers a loaded deck height of only 15 inches. Nikola Motor Company showcased its hydrogen-electric powered semi-truck, the Nikola Two, live in action for the first time to the general public at its Nikola World event. Bosch technology and expertise helped Nikola to realize the fully functional Nikola Two hydrogen-electric truck with industry-ready heavy-duty truck components and systems. The technology and system approach is adaptable for use in Nikola's full line of vehicles, including the Nikola One Sleeper Cab and the Nikola Tre, a hydrogen-electric truck for European markets. Sustainability initiatives are rapidly changing the transportation industry, with increased focus on major technological advancements to create these opportunities. At the upcoming Advanced Clean Transportation (ACT) Expo, April 23-26, 2019, Volvo Trucks (Booth #1634) will demonstrate The Bigger Picture - going beyond the truck to explore the future of trucking and sustainable transport solutions through electromobility, automation and connectivity. Mack Trucks will showcase four of its models in Mack booth 4259 during ExpoCam April 11-13 at Place Bonaventure in Montreal, Quebec, demonstrating the ability of Mack trucks to take on virtually any application. Daimler Trucks, a division in the Daimler Group, and Torc Robotics, a pioneer in autonomous driving solutions, are joining forces in a one-of-a-kind combination to commercialize highly automated trucks (SAE Level 4) on U.S. roads. Going beyond an OEM/supplier relationship, the companies signed an agreement today for Daimler AG's subsidiary Daimler Trucks and Buses Holding Inc., to acquire a majority stake in Torc Robotics for an undisclosed sum. Closing of the acquisition is subject to approval from U.S. authorities. Fleet professionals are tasked with providing safe, reliable and compliant vehicles for their organization. In many cases, fleet professionals that design these work trucks only have indirect control and/or input on how these vehicles are used after being placed in service. One of the biggest concerns is understanding the consequences of operating overloaded vehicles. This includes drivability issues, reliability and maintenance concerns, and the regulatory impacts and liability risks associated with operating overloaded vehicles. With some forethought in the vehicle design phase and broad-based education for all stakeholders, these issues can be minimized, if not completely eliminated. Operating in the ultra-competitive Seattle area construction market, Maple Valley, Washington-based Silver Streak Trucking depends on its fleet being ready to meet any challenge. That's why Silver Streak relies on Mack Trucks and its industry-leading uptime solutions to keep their trucks on the job. It has been a few years since the medium-duty truck landscape featured vehicles carrying the iconic International name. That gap has been filled, as parent company Navistar has launched the International CV series of Class 4/5 trucks – a lineup that features heavy-duty construction and power while meeting the needs of operators seeking trucks that are easily customized. Kenworth has added two new ratings for the 12.9-litre PACCAR MX-13 engine available for the Kenworth T680, T880 and W990. The PACCAR MX-13 engine brings efficiency and flexibility together into one, high-performance solution. Freightliner Trucks is proud to announce that it has awarded its top dealer sales professionals "Elite" status through its annual Leland James Elite Sales Achievement Program. The pace of change in the transportation industry is more rapid than ever and customers are demanding faster ways of communication through connectivity. A supplement to Volvo's Remote Programming, the new Parameter Plus Package was designed with thorough feedback from customers to meet the demands of their applications via over-the-air (OTA) updates while significantly increasing uptime and maintaining a firm cost control. Previously parameter and software updates, where the trucks needed to be brought to the service point, could in all require two or more days of downtime, along with the added work and costs of acquiring a supplementary truck and managing driver logistics. The new Parameter Plus Package with OTA powertrain software, updates can be completed in under 20 minutes and parameter updates in under 10 minutes. On March 6, 2019, Volvo Group participated in a demonstration of Eco-Drive technology with a Volvo VNL along two connected freight corridors in Carson, California. Eco-Drive integrates traffic signal data with vehicle dynamics to provide real-time speed recommendations. This mitigates harsh driving maneuvers and can therefore reduce the impact of freight movement through disadvantaged communities. During the NTEA Work Truck Show in Indianapolis, FUSO unveiled its new FUSO FE180 gasoline-powered cabover truck. This extension of gasoline-powered trucks offered by FUSO and exclusively for the North America marks the FE GAS series as the new standard in work trucks. Mack Trucks has introduced a new package for customers that will further maximize their uptime via Mack Over The Air, Mack's best-in-class remote programming solution that allows for remote software updates and the setting of vehicle parameters. It's not every day that a major automaker adds a brand-new nameplate to its line, but that's just what Ford did on the opening night of the 2019 NTEA Work Truck Show - launching the brand-new F-600 Super Duty chassis cab as a medium-duty truck with the right size, power and technology to tackle the toughest jobs. Mack Trucks' factory-installed auxiliary axles on Mack Granite models now feature standard shock absorbers for improved ride comfort, durability and tire life. Mack made the announcement at the Work Truck Show in Indianapolis. Ford has launched the next level of Built Ford Tough heavy-duty pickup truck capability, power and technology with the new 2020 F-Series Super Duty pickup. NTEA recently launched WorkTruckCert - An NTEA & Dec-O-Art Resource, a powerful, cloud-based program designed to streamline the completion and printing of certification labels. The new system will also archive vehicle records and help companies demonstrate conformance with NHTSA-required safety standards. At the 2019 Work Truck Show, Freightliner will exhibit a wide range of its vocational vehicles and powertrain options in booth #4659. Visitors to the booth can also explore the new battery-electric Freightliner eM2 truck. Kenworth Maska received the prestigious 2018 Kenworth Dealer of the Year Award for the United States and Canada at the annual Kenworth Dealer Meeting held recently in San Diego. Kenworth Truck Company will showcase its medium and heavy duty work trucks at The Work Truck Show March 5-8 in Indianapolis, Indiana. Kenworth will also offer up the latest information and spec'ing options for its vocational truck lineup in its booth (Number 1401). The show is sponsored by the National Truck Equipment Association (NTEA). Link Mfg., Ltd. will unveil details of its newly updated and improved 20K self-steer suspension in booth 2019 at this year's NTEA Work Truck Show in Indianapolis, Indiana. The enhanced 20K axle incorporates proven technological and component upgrades already available in the company's lighter-capacity suspensions. With the formal introduction of its upgraded 20K axle, Link has achieved its goal of consolidating its self-steer suspension lineup, creating a highly uniform offering with industry-leading advantages. Volvo Trucks has delivered its first all-electric vehicles on the 19th of February - a refuse truck to waste and recycling company Renova, and a distribution truck to the logistics company DB Schenker and partner haulier TGM, operating in Sweden. Navistar has recognized 35 of its top-performing suppliers with its annual Diamond Supplier Awards. Exclusive to the top two percent of the company's supplier base, this select group has helped Navistar deliver uptime to its customers and has exceeded performance expectations in four key metrics: quality, delivery, technology and cost. Mack Defense recently started production of five Mack Granite-based M917A3 Heavy Dump Trucks (HDT) as part of the Production Vehicle Testing (PVT) phase of its $296 million contract with the U.S. Army for armored and armor-capable HDTs. Once completed, the trucks will enter 40 weeks of rigorous durability testing at the U.S. Army's Aberdeen Test Center this summer. Debuting during media day of the Canadian International AutoShow, the 2019 Ram Heavy Duty is the most powerful, most capable pickup in the segment, the manufacturer states, with a towing capacity of up to 15,921 kg (35,100 lb) and a maximum payload capacity of up to 3,484 kg (7,680 lb). Driving it all is a never-before-seen torque rating of 1,000 lb.-ft. from the Cummins 6.7-litre High Output Turbo Diesel engine. The new Ram Heavy Duty also sets benchmarks in ride and handling, luxury, materials, innovation and technology, extending well past any competitive offerings. Giving maximum effort all day, every day with confidence, the new 2019 Ram Heavy Duty line of pickups steps forward with the full force of modern capability. Ram Truck has unveiled the 2019 Ram 1500 Classic Warlock. Uncloaked during media day at the Canadian International AutoShow, the Warlock is a witch's brew of desirable options and equipment, all wrapped in a package which pays homage to the original Warlock pickups of the 1970s. Toyota says that the 2020 Tacoma models introduced at the Chicago Auto Show are the best-equipped ever. The new 2019 Ram 3500, 4500 and 5500 Chassis Cab will usher in a new generation of work trucks — one that leads the segment in capability, but also never-before-offered comfort and technology. Ram Chassis Cab trucks are the most durable, most capable and most confident cab and chassis trucks Ram has ever engineered. With a towing capacity up to 35,220 pounds, the highest Gross Combined Weight Rating of 43,000 pounds and payload up to 12,510 pounds, Ram's heaviest haulers are built for unforgiving duty cycles while achieving new levels of efficiency and upfitter friendliness. Chevrolet has debuted the full lineup of its all-new 2020 Silverado HD — the strongest, most advanced, most capable Silverado HD ever. Max towing capability increases an enormous 52 percent to an available 16,102 kilograms (35,500 pounds). It is also the third all-new Silverado in just 18 months, each designed for different customers. Ram Truck has introduced a new Multifunction Tailgate that adds even greater cargo-management and storage utility. The Ram 1500 Multifunction Tailgate feature is unique among all pickups, according to the manufacturer, and offers customers cargo-access flexibility without compromise.